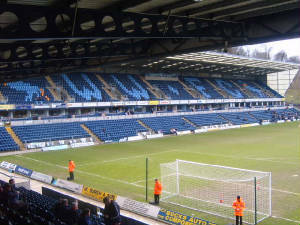 I was never looking forward to going to Wycombe, if anything, I was hoping to complete my 92 without having to go to this ground (by them going down to the conference), however, Adam's Park was to become a destination and it's a ground the has grown on me over the years. 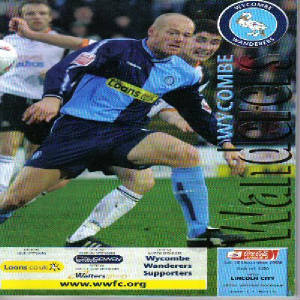 I had gone on the official coaches to this game and no-one was really looking forward to the game and getting to the ground proved to be a bit of a farce. Going around High Wycombe gives you the "rat in a maze" feeling and we didn't even have the slightest clue when we were coming up to the ground, there were no indications of anything. Suddenly the coach just stops and we're told we're there in an area that looked like it was full of warehouses. This area also proved difficult to get out of when the game had finished. Around the ground, it didn't have the football ground feeling and it felt like you were heading toward in indoor market rather than a football stadium. I quickly popped into the club shop but there was nothing of particular interest. The turnstiles weren't particully easily locateable, after many minutes of searching, I finally found them, all two of them. Going in felt extremely cramped, especially as you had the most thorough search by a steward that you'll ever had. The away end wasn't too bad to be honest, I was a fairly large seated area and although there wasn't a lot of leg room, there was a good view of the playing action and there was nothing restrictiing your view. The to the left was a fairly large seated area and it wasn't too bad, but the other two stands were poor efforts. One was a bog-standard terrace behind the goal and the other was a pitch length elevated stand that had 5/6 rows at the most. 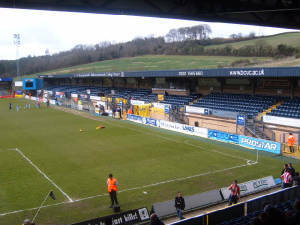 Overall, Wycombe isn't a bad place to visit but it could be so much better. There's not a lot to do near the ground but other than that it is a reasonable day out.